The few fragments of Sappho’s poetry that have come down to us from antiquity make unusually high demands of the reader. To make best sense of the poems, we have to fill in the gaps where words are missing, to connect the dots between one isolate phrase and the next. But there are ways of doing that other than with words. 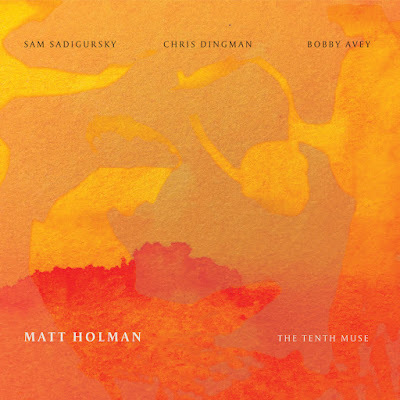 Trumpet and flugelhorn player/ composer Matt Holman has crafted twelve pieces that are both interpretive and speculative in nature, and he and his ensemble have added four improvisations that are so perfectly in keeping with the compositions you’d be hard pressed to know which is which. He’s chosen well, both in terms of Sappho translators (the poet Anne Carson) and his musicians: Chris Dingman (vibraphone), Bobby Avey (piano) and Sam Sadigursky (soprano saxophone, clarinets, flutes). This band - he had a different set of colleagues on his 2013 debut album When Flooded - play these lyrically sophisticated and occasionally songlike compositions with elegance and grace. Holman himself has a strong harmonic sensibility, and his fluid phrasing and way with melody occasionally remind me of Kenny Wheeler. Although his role isn’t spotlit, he’s always there, at the heart of the music, the pivot around which everything revolves. The compositions on The Tenth Muse have been arrived at by way of cryptograms. “Pitches and rhythms associated with specific letters or words,” as Holman explains. (J.S. Bach famously used the letters of his own name, of course.). But this is not a dry academic exercise. Holman has tried to make the music as expressive and emotionally varied as the poem fragments. To achieve the clarity required by this approach, the musicians have to work as one rather than as four individuals pursuing common ground – more akin to a string quartet than a jazz band. But there’s still plenty of improvisational room for manoeuvre, and the players take full advantage of it. The music is light, airy, and a tad mysterious – much like Sappho’s poems. It’s a fitting tribute.